The $500* price is only for the truck rental. *The fuel, our Class A licensed driver offers tips on passing the on road test based upon their evaluation of your driving performance & the scheduling of your road test is an additional fee based on the location of your scheduled TXDPS road test. The Peterbilt 587 is Peterbilt's top of the line truck equipped with either a Cummins ISX or Paccar diesel with full automatic 10 speed Ultra-Shft Autoshift automated transmission that pulls a new 2016 Hynudai 28' pup trailer. These trucks have only a brake & accelerator pedal, no clutch. To put the truck into the drive gear you just simply touch the digital screen on the dash where the "D" is & the transmission goes into gear. The transmission will automatically shift the transmission up & down for you. To put it into reverse just touch the digital screen where the "R" is and it goes into reverse. We have 18-year-old girls that do road tests every month. These trucks make passing the class A or B road test very simple the first time. The disadvantages to using a standard transmission on a Texas DPS road test are; if you grind a gear, miss a gear, stall out or float a gear YOU FAIL EVERYTHING and you must re-test on the Pre-Trip, Backing Maneuvers and another Road Test. You must be able to operate the standard transmission smoothly using the double clutch method. These trucks are very easy trucks to drive; just like driving a Chevy, Dodge or Ford pickup truck. Fort Worth & Kilgore are the 2nd easiest TXDPS road test locations in the State of Texas. You want the easiest road test...??? Dallas is the easiest road test in the State of Texas. 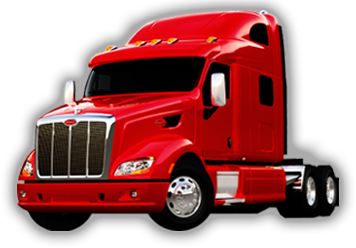 This price is for the truck rental for the Class A CDL Truck Rental which includes the instructor, insurance, fuel & our assistance with scheduling. Reason #1) All other TXDPS office's, including the office in your area; road tests generally take 1 hour up to 1 hour & 30 minutes depending on the examiner. The TXDPS offices we like to go to their class A & B road test takes 15 to 22 minutes on an average, again depending on the examiner. Reason #2) Most every TXDPS office in the state has a box marked out to parallel park the truck with no pull ups allowed. When parallel parking if you cannot perfectly park the truck 10" to 12" off the curb on the first try with no pull-ups then most examiners will fail you. The TXDPS offices we like to go to have no box to parallel the truck in. 98% of our clients only lose 0 to 4 points on the backing scoring a 94% - 98% on the road test. One TXDPS office in particular, the only office in the state, will not fail anyone on the backing. The only way that office will fail is if you jack knife the truck. You can cross their lines backing and run over the cones just don't jackknife the truck & trailer. All they will do is take a few points off the backing. The backing points do not affect the road test points like other driver liceffices. As long as you make the attempt to back and attempt to parrallel park this office will only take a few points off. Reason #3) All other TXDPS offices have curbs, traffic lights and heavy traffic. If you touch a curb then you fail the test. If you run, or get caught in, a red light you fail. If you pull out in front of a car and impede traffic slowing the car down you fail. Our TXDPS office has no curbs, no traffic lights & very little to no traffic. Reason #4) Most TXDPS offices are making people do a pre-trip inspection. There is no pre-trip inspection at the TXDPS offices we prefer. Reason #5) Before you even get to do the actual road test you must pass the air brake test on the truck. If you mess up on the air brake test and miss a step at any other driver license office in the state of Texas the TXDPS examiner will terminate your road test failing you where you will have to reschedule. TXDPS office examiners at a few offices we go to will allow you to correct yourself if you miss a step on the air brake test. In some cases the TXDPS examiner will show you how to do the air brake test then advancing you on to the road test. With all of these 5 reasons to help you pass the CDL road test these are the easiest TXDPS offices in the State of Texas to pass a road test on the first try. *The fuel, insurance, instructor & scheduling is an additional $260.00. **The $250 special does not include the fuel, insurance, instructor & scheduling. The fee for these services are $260.00.